As usual I was awake any stupid o'clock with no hope of getting back to sleep. My first wake up was 11.30pm but i managed to get back to sleep and woke again at 2.30am. Now it's a case of waiting for DH to wake or the alarm to go off before we pack up and make our way over to the car rental concourse to pick up our car and drive on up to check into the beach club. 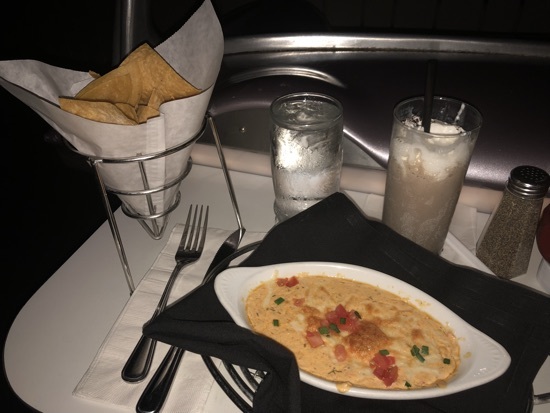 Hoping to arrive by 9am as we have a reservation for lunch at Sci Fi restaurant in Hollywood studios at 10.30am. We left the room at about 4.15am and got the monorail over to the car rental centre. When we arrived there was only 1 mid size SUV, it looked abit grubby inside so we mentioned this to one of the Alamo guys hanging around to see if there were any more and he said they would fetch another over, we ended up with a lovely Nissan Murano. We ended up leaving the Alamo garage at 4.50am and headed up the US27. 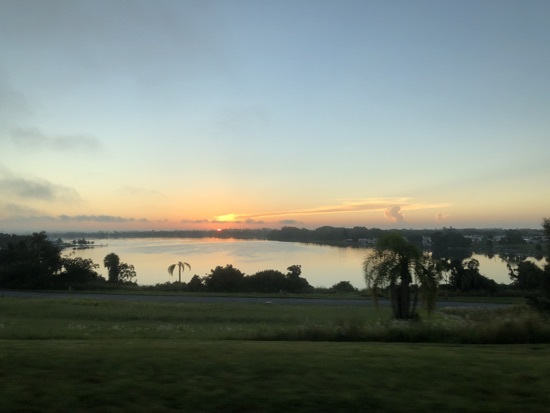 The views at sunrise over the lakes we passed was stunning. We made really good time and arrived at the beach club at 8.30am. We checked in, or room wasn't ready but the cast member at check in gave dd a colouring book and some crayons which was really lovely of her. We collected our refillable mugs and sat in the solarium having a coffee and then a second one while dd did some colouring. 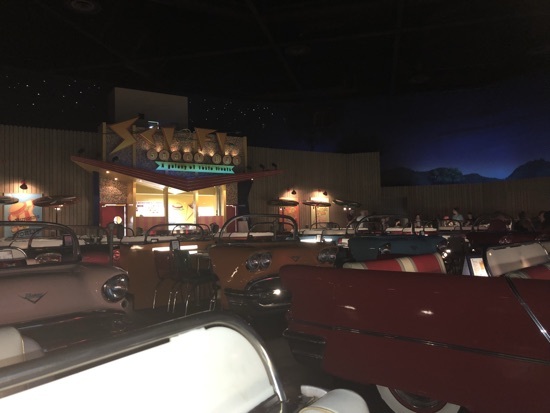 It was then time for us to make our way to Hollywood studios for our lunch reservation at Sci Fi diner. We arrived at 10.20am and were seated immediately, our server explained everything we could have with the deluxe dining plan, which I find puts me at ease that I'm not ordering something that won't be covered. She took our drink and apps order first. 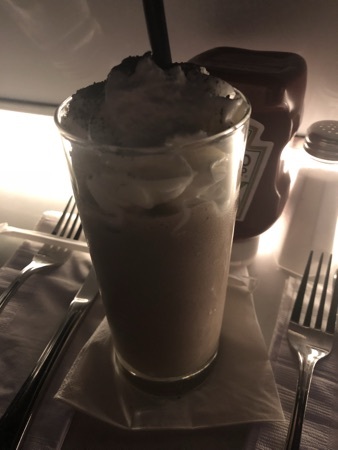 DH and I both had an orbiting Oreos shake, this was absolutely delicious, Oreo milkshake with Godiva chocolate liqueur topped with whipped cream and a glow cube. DD has a chocolate milkshake. Our server brought us a water each as well. For appetisers DH had the crab and shrimp fondue with chips, this was $9.50 and he said it was fine. 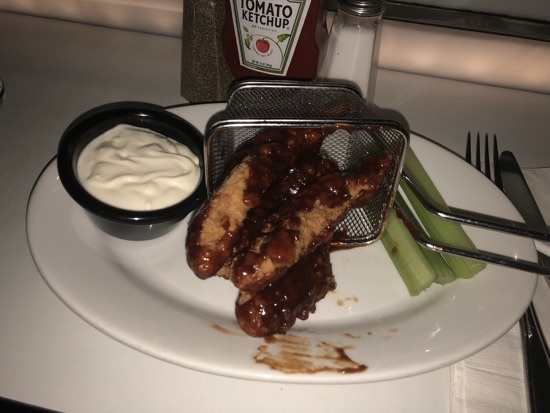 I ordered the chicken tenders with chipotle bbq sauce, they came with celery and ranch dip, I really enjoyed these, there were 4 good sized tenders. DD shared with us both. 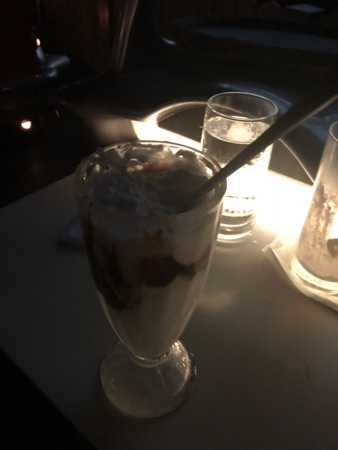 We were pretty full so I'd let dd choose my dessert, she went for the Sci Fi candy bar for £9 which was cookies and cream moose, chocolate ganache and chocolate sauce, it was pretty good and we made a good go between us. DH had the ice cream sundae for $8 which was just ice cream and fudge sauce. Can't really go wrong with that. 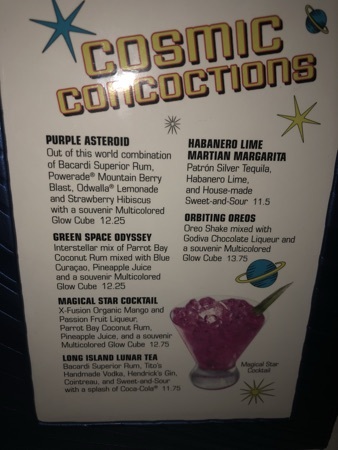 This is the cocktail menu for Sci Fi. 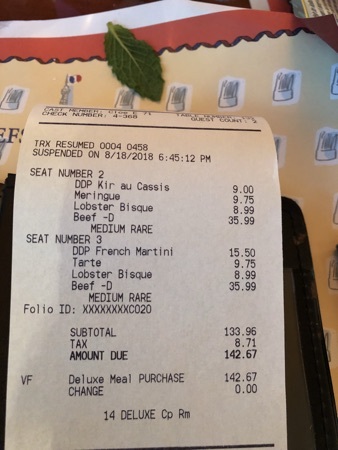 Our total came to $127.27, I don't think it was worth that in terms of quantity and quality of food but for 2 dining credits we thought it was pretty good. Our server didn't charge us for DDs shake which was very nice of her, so we left her the cost of it added to the tip. After lunch we walked back to the beach club and as I reconnected to the Wifi as we walked past the yacht club our email telling us our room was ready came through. 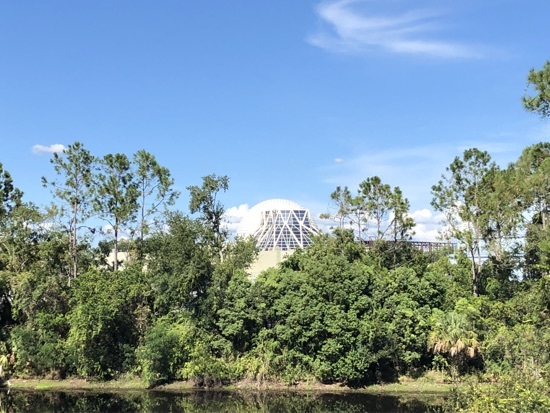 We've got a lovely room over looking the Epcot ball which we are more than pleased with for 2 nights. It's quite a walk to refill our mugs but I don't mind. We got changed into our swimming stuff and spent a few hours this afternoon in stormalong bay, this pool is fantastic, it's a huge selling point of this resort! Dd loves he slide and the sand to build sand castles and it even has its own lazy river! After a few hours in the pool we made our way back to the room to get changed for our dinner reservation at 6pm at chefs de France in Epcot. 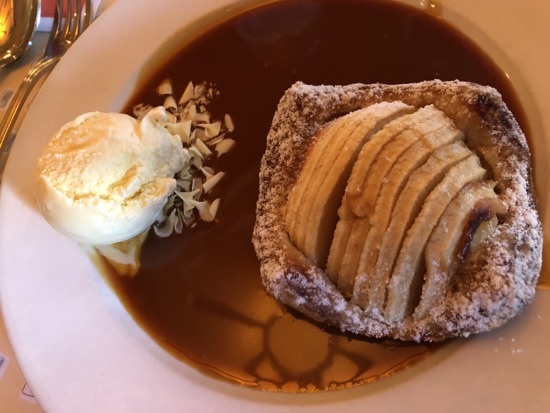 This was one of our favourite meals at Easter so we were really keen to return, hoping for a similar experience tonight. We entered Epcot through the international gateway and dd's magic band kept turning the tapstile blue. DH and I both had no problems. When the lady at the tapstile scanned DDs magic band she said it was linked to DH and when she scanned his it was linked to me and mine was linked to DD. She told us we needed to see guest relations to sort it out but signed DD in. 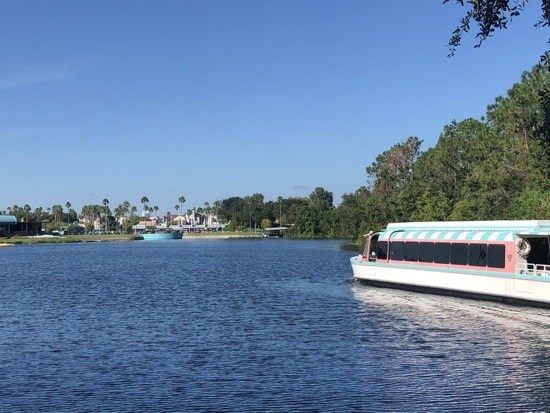 We didn't think this could be the problem as DH and I had both for in no problems and all 3 bands worked fine to the correct people in Hollywood studios this morning. After that hold up we arrived at les chefs de France right on our reservation time. We checked in and were seated almost immediately. 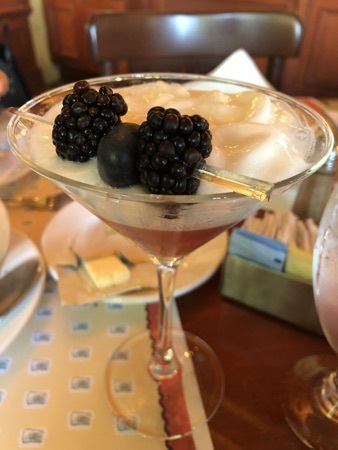 We ordered drinks, DH had a French martini - vodka, Chambord, pineapple juice and topped with lemon lime foam, this was $15.50 and he really enjoyed it. 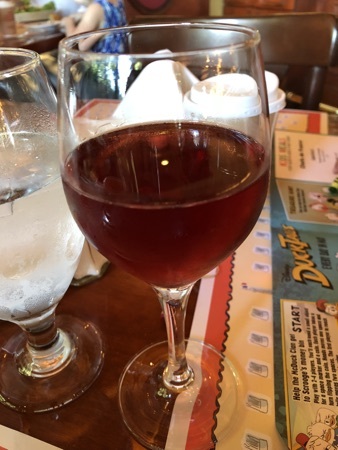 I had the kir au cassis - Chardonnay and cassis, this was $9 and was ok.
DH and I had starters, both of us went for the lobster bisque, this was absolutely delicious, so rice and creamy with big lumps of lobster, I could have licked that bowl clean! 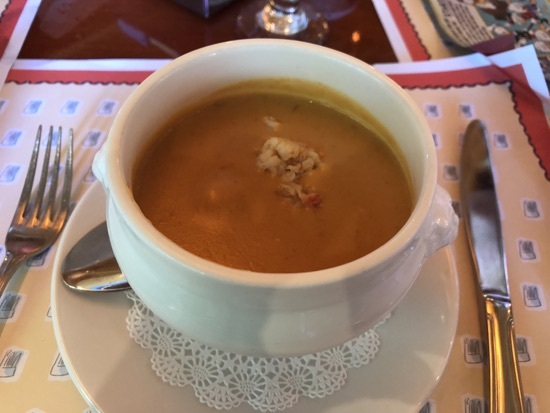 It was served with some authentic French bread and butter which was very nice and went great with it. 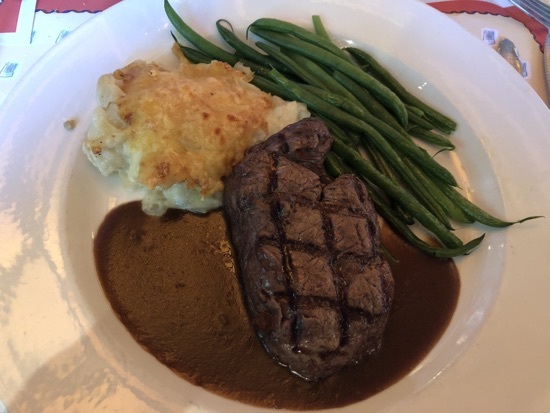 For our mains DH and I ordered the same again, the grilled beef tenderloin, this was served with potato dauphinois and green beans with a peppercorn sauce. The sauce is more of a jus/gravy but is really good, the potato dauphinois is excellent so creamy and garlicky. The beef was cooked a perfect medium-rare and every bite was perfect. This was not cheap at $35.99 but I couldn't fault a single thing. 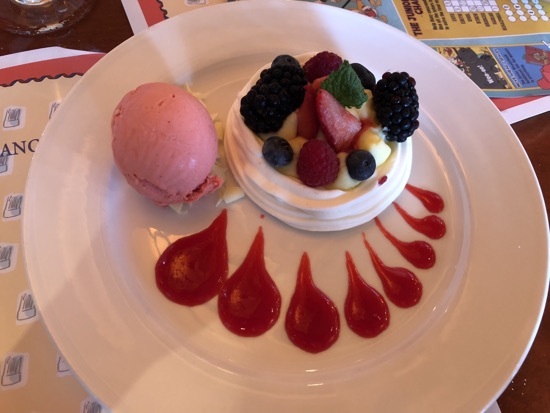 Dd and I shared the meringue and summer berries this came served with strawberry sorbet and strawberry sauce, dd ate most of this and really enjoyed it. I finished off what she couldn't manage and it was really nice. 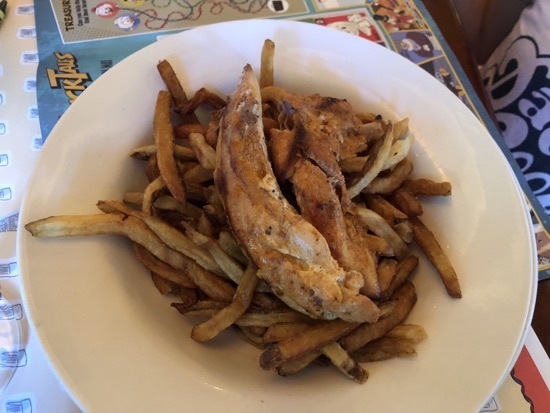 Total bill was $12 for DDs chicken and coke which we paid cash for and The rest was covered by 2 dining credits, the cost should have been $142.67. 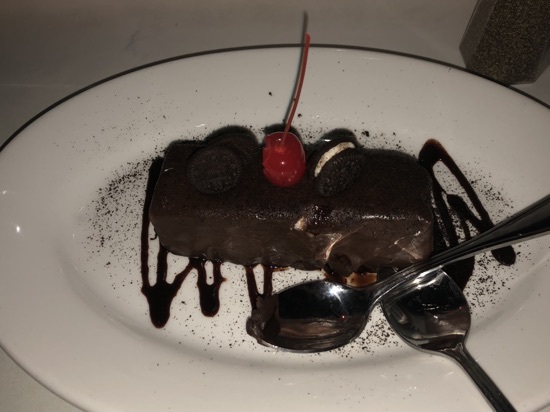 This meal was as good as last time, I also feel by sharing deserts with DD I'm not eating way too much and she enjoys the adult deserts much more rather than the constant &lsquo;ice cream or fruit' kids options. We left les chefs de France and walked round the back to boulangerie patisserie des Halles and picked up 2 ham and cheese croissants. These are for our breakfast in the morning, we used 2 snack credits to pay for these but they should have been $5.69 each. 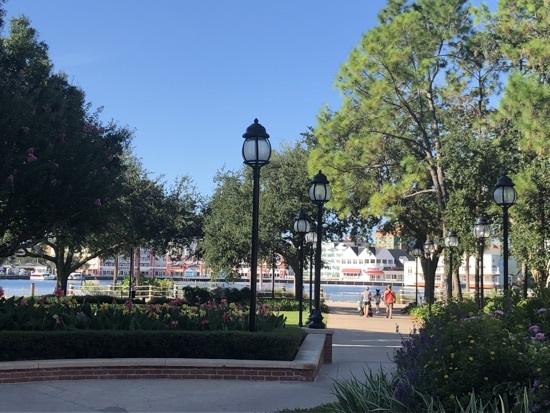 We left Epcot and made the short walk back to our resort. We called in to see the concierge and explained our problem with the magic bands, when they were checked there was no problem at all with them and they were all correctly linked so who knows what the problem was. 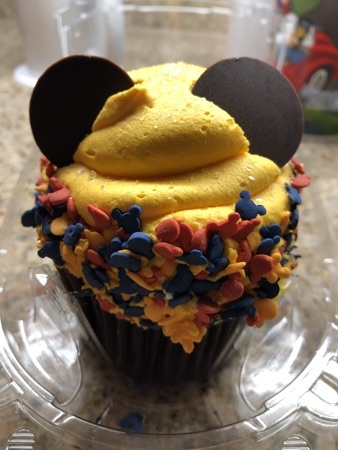 We filled up our refillable mugs in the marketplace and DD decided to spend a snack credit on a vanilla cupcake which will be breakfast in the morning with our croissants - better picture to follow in the morning . We've decided to have an early night as we're all shattered after our travel days and early start this morning. Hope you enjoyed magic kingdom! The weather has been amazing today! 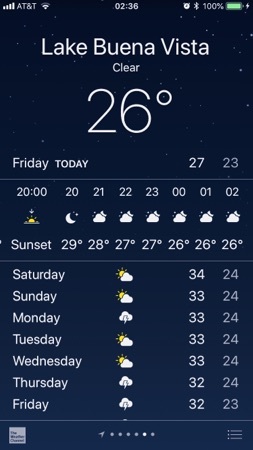 New Photo Added by missdopey - 19 Aug 18 8:37 AM. A really good day, with very tasty looking food. Great first day ! Love that pool!